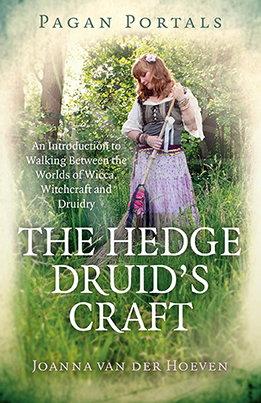 Joanna Van Der Hoeven’s new release with Moon Books in the Pagan Portals series, The Hedge Druid’s Craft, draws from the well-known practices of Wicca, Traditional Witchcraft (including the cunning artes) and Druidry. Using the techniques of ‘hedge riding’ to travel between the worlds and realms, the author directs the inquisitive reader into a clear understanding of how to work with boundaries and liminal space. These are a key to expanding magical ways of bringing back enchantment perhaps lost from our everyday modern lives. Van De Hoeven has written many books, primarily about aspects of Druidry, with her unique and well placed understanding of its place in the world. Her writing style is engaging and the book is written in a straight forward and concise way. The author is both instructive and encouraging, whilst maintaining authority of the subject. I particularly enjoyed the chapter on weather lore, something I had not studied before but am now keen to research further. I found her guide to using herbs and plants in the Plant Lore section, very informative and inspiring. I was also impressed that the author included her own personal experiences when appropriate, such as being privileged to witness a group of adders being born and being visited by a fairy, these very poignantly add to the credibility of each aspect of Hedge Druidry. I believe that anyone who is seeking a way of including different aspects of Wicca, Witchcraft and Druidry in their unique practice will find The Hedge Druid’s Craft an essential tool to enable success. This is definitely THE book for those whose spiritual beliefs overlap into different paths but who also want some structure to their practice. If this is you then you should definitely buy this book! Review Details: The Hedge Druid’s Craft was reviewed by Thea Prothero and the review was published in Issue 38 of Indie Shaman.